Whether you would like a complete garden design and rebuild or just want help with an individual bed or landscaping project, we are on hand to help. We offer a professional & friendly service, combining a flair for design with extensive practical and horticultural knowledge. We have over 15 years experience and a diploma in Garden Design. 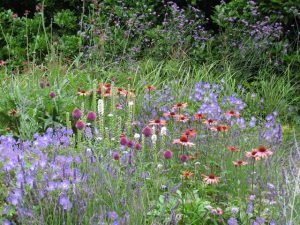 We have worked on a wide variety of sizes and styles of gardens from small contemporary gardens to large countryside gardens. We have an extensive portfolio of finished gardens in Norwich, Norfolk, Suffolk & Cambridgeshire. We place particular emphasis on using traditional, local materials such as reclaimed paments, floor bricks, and flint cobbles. This is kinder to the environment and, in many cases, we can utilise materials already in existence in the garden. “Both myself and Steve are thrilled, you have taken everything within our brief and managed to fit it into the space without it appearing to be overcrowded. We loved the feeling of having three defined areas to the garden and the use of lighting and planting, reclaimed materials, etc., Fundamentally there was nothing about the design that we would change – it’s all very exciting!! See Sarah & Steve’s garden.